← On The Road, And Then? It’s done! The papers are signed, keys exchanged, and all that jazz. 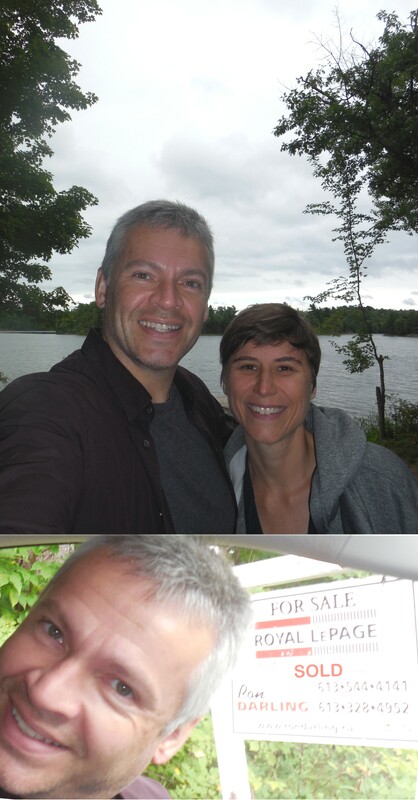 We had two great years at our cottage on North Otter Lake, but come the start of season three, much like Jerry and Jeannie on Seinfeld, we came to a mutual agreement that it was time to part ways (with the cottage, that is). We said goodbye to the cottage on Thursday! So, for those many caring persons who were concerned that we hadn’t made it up there much this summer, now you know the scoop. It had to do with a lot of factors. This includes the return of CFL football in Ottawa, a long-awaited event, and as season ticket holders, we don’t want to miss a game if we can help it. Since most of them are on weekends during cottage season, there’s a choice to be made. Other significant factors included our work-vacation road trip down the Pacific Coast Highway (reminding us of how much we like to travel and see new things) and re-activating our interest in tennis (as players). That’s a lot of interests and activities to manage alongside the cottage scene. Probably the simple way to say it is we grew bored of the cottage. It was the perfect size for us, the lake is clean, there’s kayaking and hiking…no problem! Except that we’ve seen every inch of the lake many times over, we’ve driven all the different routes on the road trip, and we just weren’t feeling it anymore. We’d have been sitting on the dock trying to relax and thinking about the tennis tournament of football game or night out with friends we were missing. You never know until you try! We enjoyed our two years and will remember them fondly, but we are excited to look ahead to future summers full of different adventures!